Join the fun at Millets Farm Centre for their 6th Family Dog Show! The Dog Show is a free charity event in support of the Guide Dog Association and is sponsored by Hilltop Vets. There will be 12 dog classes throughout the day, with great prizes on offer along with a selection of stalls and a BBQ surrounding the arena! It really will be a day for all the family especially your four legged friends, so whether it be entering one of the more formal classes in the morning or taking part in the fun afternoon classes or even mooching around the stalls…There will be something for everyone! Returning this year is Lisa Moore and her Pop Up Photo Studio to capture your family and beloved dog! Photo shoots will run throughout the day, so please visit www.lovekidsphoto.co.uk to pre book your time slot. ‘Temptation Alley’ will also be returning…Can your dog avoid temptation and come to you without picking up or eating anything en route? Come and have a go! All ages and dogs welcome…This is one for all the family! 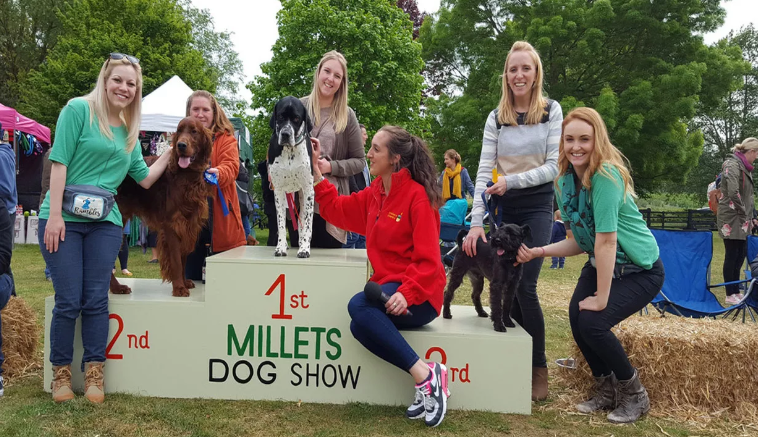 Best Rescue…Millets Farm Dog Show would love to hear the stories behind your rescue dogs so this year they would like you to send in your stories with a picture of your dog/s via email (events@milletsfarmcentre.com) by Wednesday 9th May. Every email will be read and the most special story will be selected; The winner will receive a prize and be invited to attend the show and your story be read out in the arena at a given time during the day. For more information, and to book classes, click here.